I am so sorry about your granddaughter's dog. Prayers for all of you and it's nice that she has a family to help her through her grief of losing a pet. How old is your granddaughter? Pets bring us so much comfort. I wish my Mom could have a pet in her assisted living apartment. It would mean more to her than most people would think. Warm blessings this morning to everyone. Been reading here everyday. Chubbie and the criminal are doing well - just digging up my yard! How nice of Chubbie and the Criminal to start your spring planting for you. Sister....Bless you for adopting and adult rescue from Alabama. My sister now is in some kind of a blue boot that allows her to be more mobil and this is good news. Can stay home and pay more attension to all my animals. Now that we discovered that Bailey is deaf, looks like this is his home. Jazz has adopted him as a play buddy. Mac doesn't play (old age ) and the other guys are too small and might get stepped on or somehow hurt. The donks are doing fine and the lumps on Lumpy's side don't seem to be growing (keeping fingers crossed ) Can't wait for warmer weather so the donks can graze in the pastures. They are not going out of the barn much and they need exercise and give me a break in mucking out the barn..I'm getting OLD!!!! Keeping all the monkeys in my thoughts and prayers. I'm getting a new fur-baby! I'm getting a new fur-baby! she is beautiful and is coming from Alabama! Should have her by March 10th -- as must do a quarantine of 10 days. I have decided to name her Belle -- as in southern belle cause she is coming from Alabama. Baby cakes will be a good nickname! Because she is crossing state lines there has to be a 10 day quarantine -- but it will be worth the wait. How cute! Belle will be ringing your bell any minute! Passed the home inspection! to get Belle. I am so glad these folks care so much about placing the animals. Now, if we could just get people to have the same care when they place children . . . 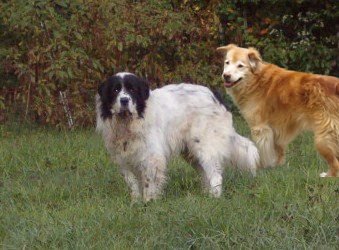 I added Brandi into your picture of Bailey, since they both are in the same boat. At 13, Brandi is just about deaf. I taught her many hand signals over the years, just in case she did go deaf in her old age, and to be able to communicate with her quietly, when someone was asleep, for instance. It has come in handy. But getting her attention without actually being close enough to touch her, has been a challenge. I try to tap the floor or the ground, making a vibration she can feel to get her attention. She seems just as happy now as she has ever been, not showing any signs of being unhappy because of her deafness. Always good to hear from you, 4 Donks. ...and I so agree with you about children. Belle will be there soon! As long as Bailey is with Jazz I have no problem getting his attention to give hand signals. My fear is having him away from Jazz and running on the 60 acres....no way to get his attention to give hand signals. Bailey is still young and growing (140 + lbs and growing) and when excited leaps into the air and spins in a complete circle before landing. AWESOME !! but not so great in the house. Furniture moving is his chosen career When he comes into the house I have the little guys in another room till he settles down. Never a dull moment. Although he was to be a foster till his heartworm treatment was completed and he could be put up for adoption..he's a good dog just young and energetic. No way I could let them put him down. She was such a good dog, cannot fathom why they wanted to euthanize her. I thought when we got the new dog pound it was a NO KILL SHELTER!!! So glad I got Patton when I did because he was heart worm positive, they could have put him down for that. JERKS!! Sea, she was at the Irving Pound, she is alive, with a foster home around somewhere South Texas. She was SOOOO sweet. I miss her badly. At least I know she is safe. 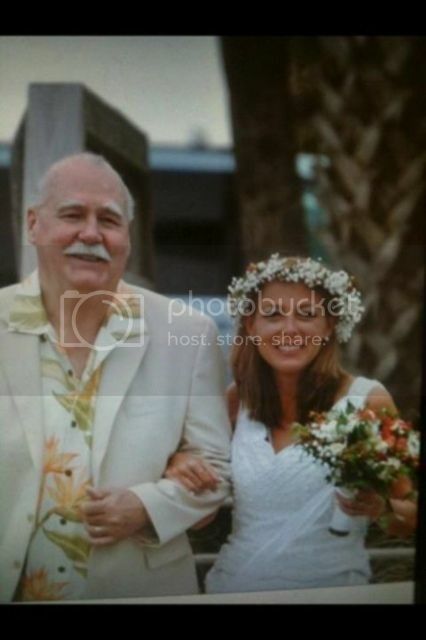 I love how the colors on Dad's shirt and the flowers, are Coordinated. Molly is a sweetie. 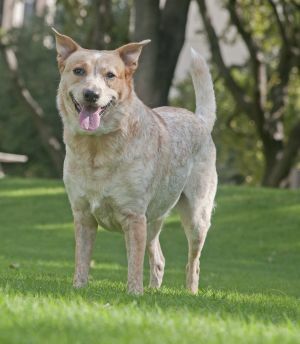 She's a 5 year old female red heeler given up by her owners because they were having a baby. She's spayed and vaccinated. We'll have more information about Molly soon! 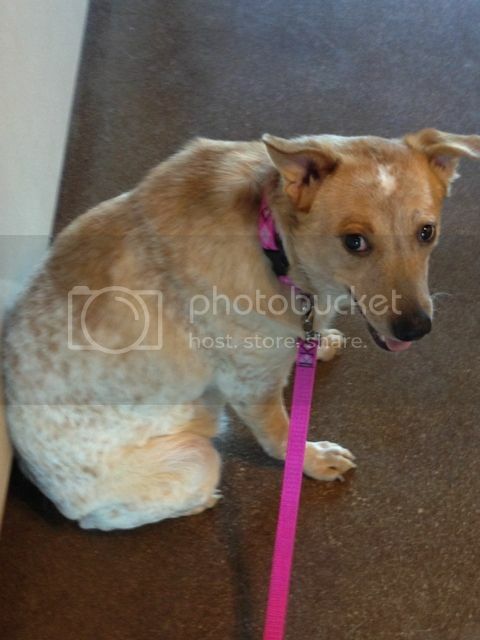 Thanks for considering a dog from Texas Cattle Dog Rescue! 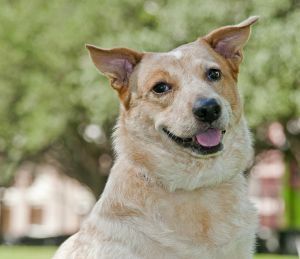 We place heelers all over the state of Texas. Thanks Klaas. I sure wish someone would give Molly a forever home, she was dumped off at the pound with a male weeinie dog. The vet at the pound said she was "diabetic" she wasn't just had a UTI. That is why she was in the to be euthanized list. I think God for TCDR, they pulled her, and all I did was pick her up and sneak her in the apartment for a weekend. Does anyone have any tips on door solicitors?? Homeowners are not answering landlines, because, of caller ID, and cell phones. it did not intimidate me, I told her, go away, or I'm calling and shut the door. in case), anything, important comes up. An older male friend used to answer the door nekkid (at least he said he did). How did you discover Molly, was it Serendipity? I would not mess with Dad, he looks like a rough tough cream puff. No disrespect. Could really use some prayers for Lumpy. I went to the barn this morning and he was down and couldn't get up. My sister, neighbour, me and the vet working together finally got him on his feet. Spent the rest of the day with him on a lead walking him to keep him on his feet. They are doing bloodwork and other tests to see what's wrong. My heart is really breaking over this. I'm so sorry 4 Donks. I hope the vet can find out what's wrong and remedy it. I've added Lumpy to my prayers. So sorry to hear this, 4 Donks. I so hope he will be better soon and that there is nothing seriously wrong with him. OH no - prayers for both of you! Please let me know. Morning prayers for 4Donks and Lumpy. 4Donks Prayers and Hugs for Lumpy and you. Prayers the Vet figures out whats wrong so he can start a treatment for Lumpy. Stay strong 4Donks. Please let us know what the vet says. Page created in 1.608 seconds with 19 queries.